October 9, 2012 - A Sprint fiber network cable severed in the Seattle area significantly delayed Alaska Airlines and Horizon Air flights on Monday. Sprint provides the airlines with connectivity to SABRE, the system the carriers use for reservations, to check in passengers and to purchase tickets. Sprint internet service was disrupted at 7:30 a.m. and was restored about noon. As of noon, the two airlines had canceled 70 flights, affecting more than 6,000 passengers. More than 130 flights had departed, some up to four hours late. Alaska and Horizon had pre-cancelled flights scheduled to depart between 2 and 5 p.m. to help return their operation to normal. Customers traveling October 8 or 9 can change their ticket or request a refund by Oct. 9 and reschedule their travel through Oct. 22 without incurring any change fees. "We apologize for this disruption to our customers," Alaska Airlines President and CEO Brad Tilden said. "We've been working aggressively with Sprint and SABRE to get our operations back to normal as quickly as possible and will maintain our efforts until we get all of our customers where they need to go." Alaska IT specialists worked with Sprint and SABRE throughout the morning to find an alternative way to restore a connection that would allow customers to check in. Alaska Airlines implemented a manual process to check in passengers, however, the process was very slow. Alaska Airlines, a subsidiary of Alaska Air Group, together with its partner regional airlines, serves 95 cities through an expansive network in Alaska, the Lower 48, Hawaii, Canada and Mexico. 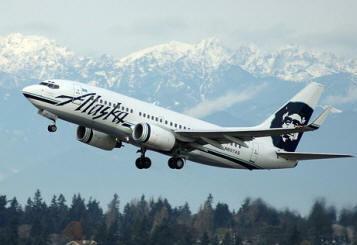 Alaska Airlines has ranked "Highest in Customer Satisfaction Among Traditional Network Carriers" in the J.D. Power and Associates North America Airline Satisfaction StudySM for five consecutive years from 2008 to 2012.